Have you think about your future plan your commitments your meetings special days such as marriage anniversary, your birth day, birth day of your spouse, you’re loving children, your girlfriend/boy friend or any other relation to whom you admire in your life so much. Similarly the death anniversary of your beloved reminds you to pay tribute in order to recall your memories. In this fast growing time every one wants to keep in touch with all these memorable events. Here is an amazing solution of your all worries regarding these necessary matters in your life. Here I am sharing single page printable A4 size Calendar from 1947 to 2047. 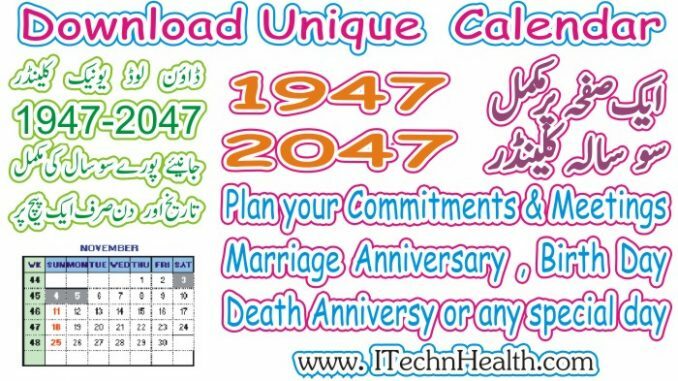 You can download the unique calendar 1947-2047 by clicking on link given below. This single page calendar showing complete detail from years 1947 To 2047 in one single page. In this calendar you can see any date and day from 20th and 21 century in one single page. Below you will find the continuous calendars for the 20th and 21st century in one single page and also know the method how to use this calendar. You can try it. Have a fun! Enjoy it! And if you like please share it with your love one. First select the year you want to see. Then select month from table given next to year . Last thing to do is to view the Day. If you want to see a specific date and day of year 2017. For example if you want to see detail about 20-8-2017. First you go to “Table of Year” at Row 3 in Column 8 you can see the year 2017. Next you go to see the required month in same Row (Row 3) you can see 8 August in Column name Aug: “B”. Now you can go to below given table “B”. Here you can see what day is on 20th August. You can easily find that on 20th Aught it is Sunday. The same way you can find any day of any year between 947 to 2047. Calendars repeat themselves find out which years share the same calendar dates and reuse your calendar. The new year 2018 is coming soon, so I want to share with you new year Calendar with Pakistani Holidays. It is a Pakistani calendar 2018 in Portrait; Microsoft Excel format included a complete public holiday schedule. You can download and print your desired size, such as A4, Legal and Letter size page. These are four new Pakistani Calendars 2018 and good for your office table or board. 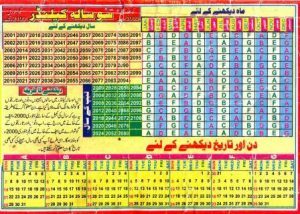 These new Pakistani calendars 2018, included a complete government holidays schedule. You can download this calendar in link given below and print your desired size.